With a number of recent exhibitions on both sides of the atlantic recognising her practice, the work of American multi-media artist Gretchen Bender is experiencing something of a moment. What took so long, asks Mike Pinnington. In the 1980s Gretchen Bender was immersed in New York’s vibrant art scene, a contemporary of the ‘Pictures’ generation of artists (Robert Longo, Barbara Kruger and Cindy Sherman et al) who appropriated mass media imagery for critical ends. Working with TV, video and computer generated graphics, her own work put her in the vanguard of new media artists. Commenting on the cultural landscape of late twentieth century capitalism which was, as she saw it, ‘a culture saturated by corporate self-representation’, Bender was artist as saboteur, infiltrating mass media and – as argued in Compass, our guide to Tate Liverpool’s programme – ‘attacking the zeitgeist on its own terms’. 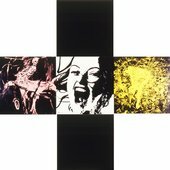 Earlier in the decade she had experimented with combining multiple images in static form, perhaps most notably in The Pleasure is Back 1982, where imagery scanned from TV and art history is applied to sign-tin and highlights processes of signification and mediation. But it was works such as Wild Dead 1984 and Total Recall 1987 – examples of what Bender referred to as ‘electronic theatre’ – that displayed her tendency toward and real proficiency with cutting edge technology. This subversion of mainstream platforms went a step further still in her more commercial endeavours – music videos for REM and New Order, among others, as well as the title sequence for reality TV show America’s Most Wanted; all of which utilised Bender’s by-now-signature barrage-editing style. Her most seminal work, which takes centre stage in the exhibition at Tate Liverpool, remains Total Recall (its name a result of Bender’s trawling through movie industry trade publications such as Variety for as yet unreleased film titles): the large-scale installation consisting of 24 colour monitors and three projection screens is a startlingly pointed piece, splicing together and juxtaposing imagery from ostensibly disparate sources. The result is deeply affecting. A disconcerting, almost sinister assault on the senses (‘veteran cyberpunk composer’ Stuart Argabright’s soundtrack only augments the experience) combines clips from movies, TV commercials and broadcast news, to reframe the effect of mass media imagery on an audience, whose expectations of a traditionally passive relationship with the ‘box in the corner’ of our living rooms, is repackaged to become anything but. I think that the time limit to media-oriented artwork is an element that many media involved artists are unwilling to confront: art as I practice it or develop my ideas or aesthetics, has to do with a temporal limit to its meaningfulness in the culture – and that’s real tough.’ Acknowledging that ‘Style gets absorbed really fast by the culture,’ she continued: ‘You have to make some kind of break or glitch in the media somewhere else with a different style and shove your content into it there. It’s constantly having to accept the fact that your work will lose its strength. While the technology with which Bender was working at the height of her creative powers may have changed exponentially, the prevailing concerns that informed and were at the centre of her practice, remain and continue to resonate today. If anything society’s reliance on the now commonplace accoutrements of twenty first century living: email, iPhones, social networking and YouTube, to name a few, renders Bender’s investigations into the mass media and political and corporate ideology increasingly relevant. So, no wonder that, if a little belatedly (and around a decade since her death), this has led to a subsequent critical re-evaluation of her work; following retrospectives in her home country in recent years, the Gretchen Bender show at Tate Liverpool represents the first solo exhibition of the artist’s work in the UK to date.